The big message of this book is that the Earth is a single, understandable system in which everything joins together. Nowhere is this more apparent than when we consider the hydrological cycle. This is the machine that connects the Earths airy, watery and icy zones. In these pages, these parts of the planet are separated out because mingling them in a single chapter would have led to a muddle. But a water molecule that is in the Atlantic today could tomorrow form part of a snowdrift in Greenland, or be carried along in a stream in France. 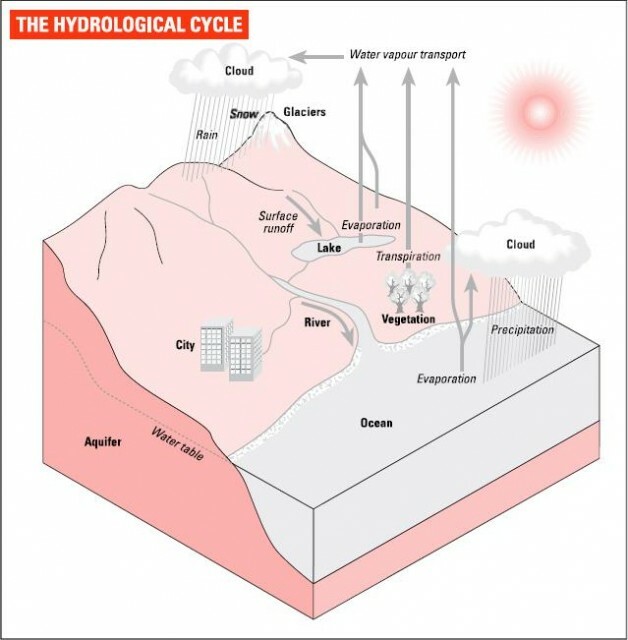 The hydrological cycle is not a completely closed system. Some water molecules do escape the Earths gravity into space, while new ones arrive with cosmic impacts (a big comet like Hailey contains hundreds of billions of tonnes of water). But these processes occur at an immeasurably slow rate. So the cycle is more or less self-contained. This means we could start describing it at any point. Lets stick with tradition and start at the surface of a sea or ocean. Because it exists as both a liquid and a vapour at the Earths surface temperature, water is constantly evaporating at the sea surface. As we saw’ in the previous chapter, this process is at its most vigorous in and around the tropics. As the air just above ground level is heated by surface warmth, it rises, taking water vapour with it. Clouds form and, at some point, the water in the clouds finds its way back to the surface as snow or rain. Most of this evaporation (86 percent of it) comes from the oceans, but the majority of it ends up straight back there. Seventy-eight percent of precipitation also occurs over the oceans, which must make the hydro-logical cycle one of natures less efficient machines. But the cycle gets more complex when rain or snow falls on land. If it falls as snow on Greenland or the Antarctic, water can be trapped, perhaps for millions of years, until the slow march of glaciers returns it to the ocean. But if it falls on a more temperate continent, any number of things can happen to it. Although its eventual fate is to close the cycle by returning to the oceans, water can spend thousands of years in this tangled part of the process. It might land in a river and head straight back to sea. Or it could fall on the land and flow over the surface to a river or stream, in which case it is classed as runoff. In the spring thaw, large quantities of snow-melt (runoff produced by melting snow) swell rivers and can lead to flooding. Rain might be absorbed into soil and end up in an underground water deposit, or aquifer. It could be absorbed by plant roots and taken into living systems, perhaps ending up inside a human body or that of some other animal. If you breathe a water molecule out, it becomes atmospheric water vapour once again. Water on land is increasingly being captured for human uses such as drinking, agriculture, food manufacturing and industry. In the developed world the hydrological cycle on land is rarely seen working in its natural form. Even national parks and other preserved areas usually have their dams and flood-control systems.